Monterosso Al Mare, Vernazza, Corniglia, Manarola, Riomaggiore. The names evoke a sense of nostalgia even to those who have yet to experience the idyllic golden languor that is daily life in this corner of Italy. 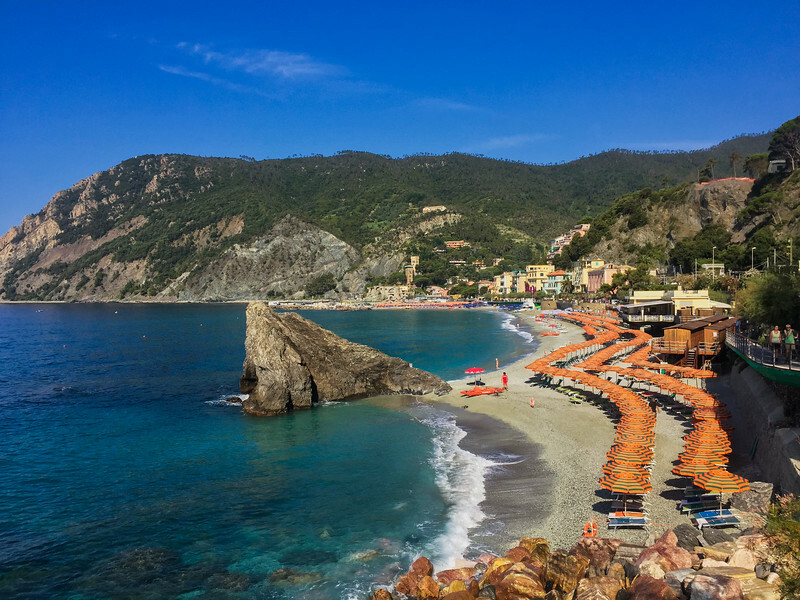 These are the five villages that make up the Cinque Terre, precariously and miraculously laid out on an isolated stretch of rugged coastline overlooking the Ligurian Sea. 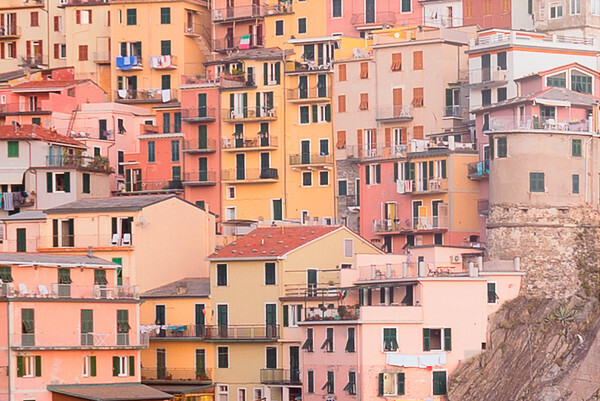 Pastel beauty defines this part of the Italian Riviera, with brightly colored houses crowding along each cliffside and harbor. 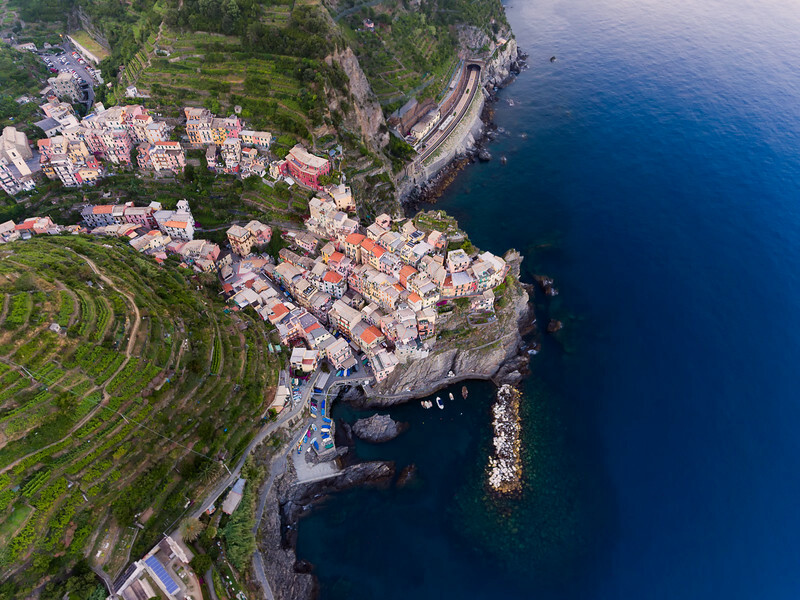 Connected by meandering, sometimes impossible pathways meticulously carved out of the rock face, the Cinque Terre feels passed over by the modern world. It remains virtually automobile free and, even though recent years have seen an unsustainable explosion in tourism complete with cruise ships and fanny packs, for those who spend a little bit of time here, life seems to slow down. It was this delightful essence I hoped to capture during the few days I spent exploring the area with my wife. 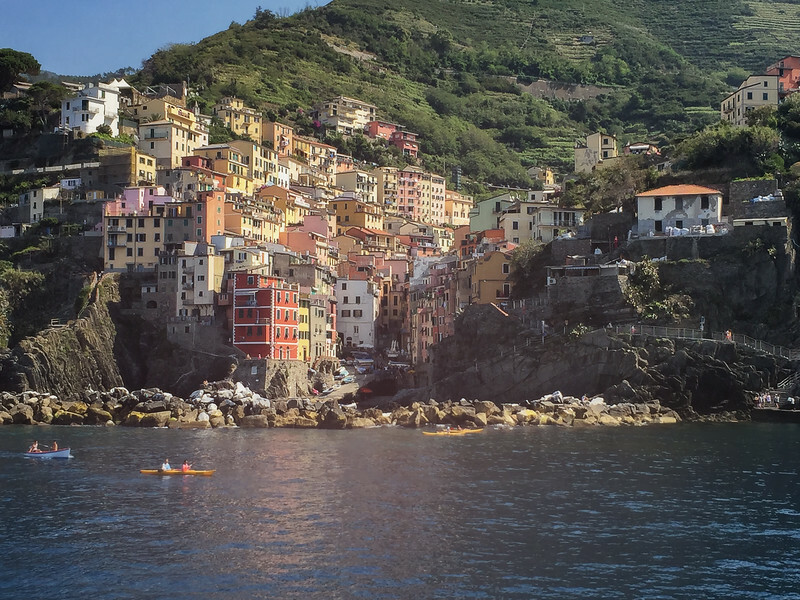 Even when we were surrounded by crowds jostling through narrow alleyways, we felt like we were all alone and that the Cinque Terre existed just for us. Here are some of my tips for photographing this special, vibrant part of Italy. There's a cliche about early birds and worms, but more apropos is that the early photographer gets tourist-free images in good light. If you want to make sure your shots stand out, set your alarm clock for half-past insanely early and start your day before the sun breaks the horizon. Wandering around world-famous locations and having them all to yourself can be a cherished experience. It's a great opportunity to try out a variety of angles and compositions, experiment with light flares, and photograph to your heart's content without dealing with swarms of tourists in your frame. Having the main harbor of Vernazza to myself at dawn was a delight. I walked down to the end of the rocks and set up my camera and tripod for a time lapse while taking my drone out for a spin (more on that to come). A couple of hours later, I was dining al fresco, enjoying an espresso and focaccia fresh from the oven, drizzled with olive oil and salt. If only every day could start like that one! I spent an equally enjoyable morning in Manarola beating the rooster's crow and photographing the enchanting homes that hug the cliff. In the early dawn light, the laundry hanging out to dry on the balconies among the vivid palette of colors caught my eye; the serene simplicity was breathtaking. 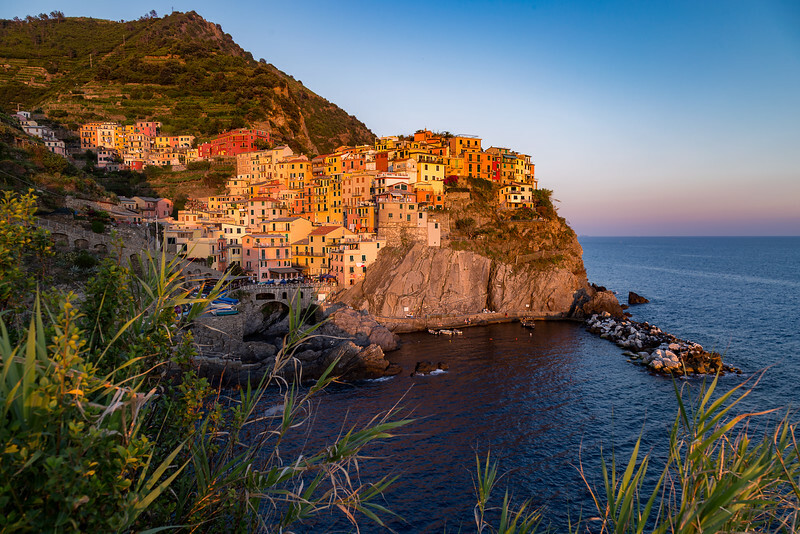 We chose to stay in Manarola, the prettiest of the five towns. Very rarely does a place you've seen a million times in photos actually surpass expectations when you finally experience it in person. 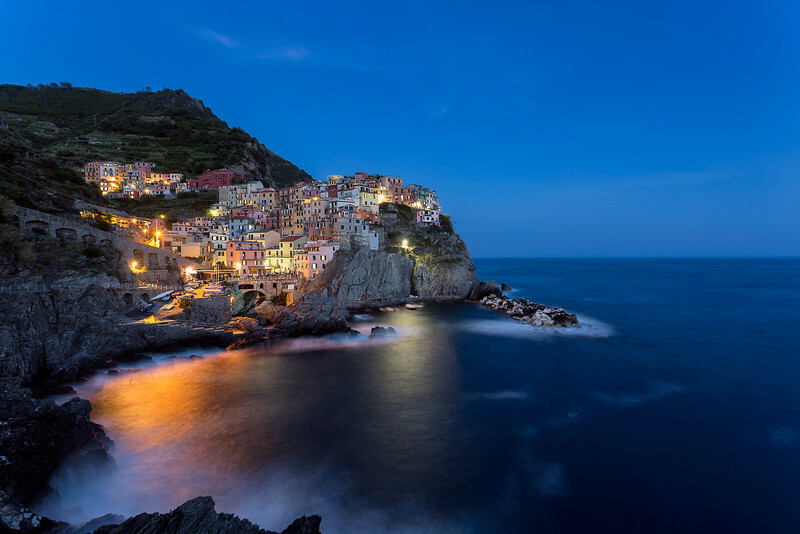 Manarola is one of those places. It's a still life on the rocks, a living postcard always shining bright. The classic wide angle view was ideal for shooting through a variety of lighting situations. I photographed this perfect little town from Golden Hour to dusk to Blue Hour, mesmerized by how its beauty changed with the fluctuating light of the day. 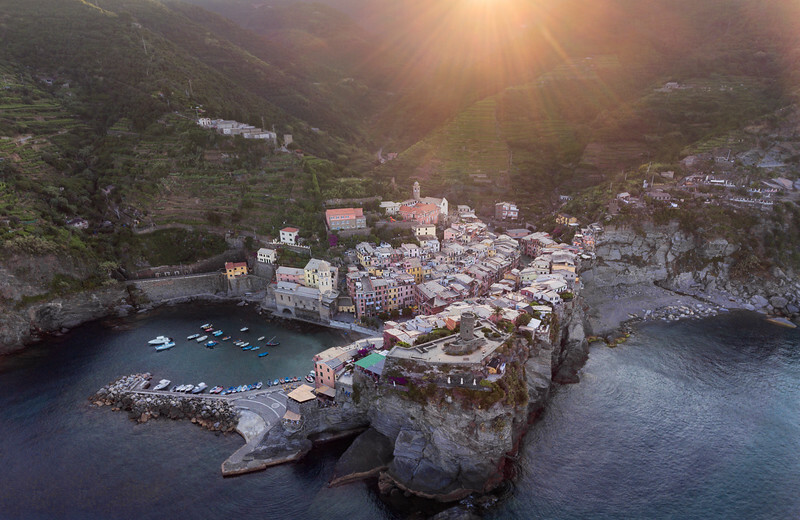 As the sun inched closer toward the sea, golden rays streamed onto the facades of the houses and the cliff, bathing everything in soft, beautiful light. This accentuated the vibrant colors, creating a wonderful atmosphere of dynamic contrast between light and shadow. I found a group of plants to provide a nice foreground frame for the scene. Sunset was understated, with only some faint pinks emerging on the horizon. But the fading light meant that I was able to use a longer shutter speed to surreally smooth out the water. The rocks in the foreground provided a great leading line around and through the image to the town. As I detailed in a previous article, "Paris in the Rain", the Blue Hour is the period of twilight every morning and evening where there is neither full daylight nor complete darkness. It is full of romance and mystery, a time when the world is in flux and possibility is just around the corner. 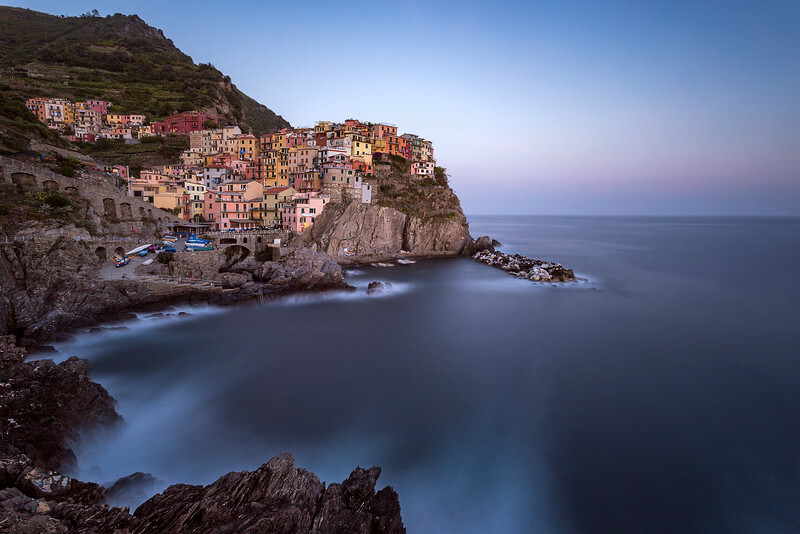 It is one of the best times to photograph cities or landscapes and is tailor-made for the Cinque Terre where man and nature are so wonderfully intertwined. 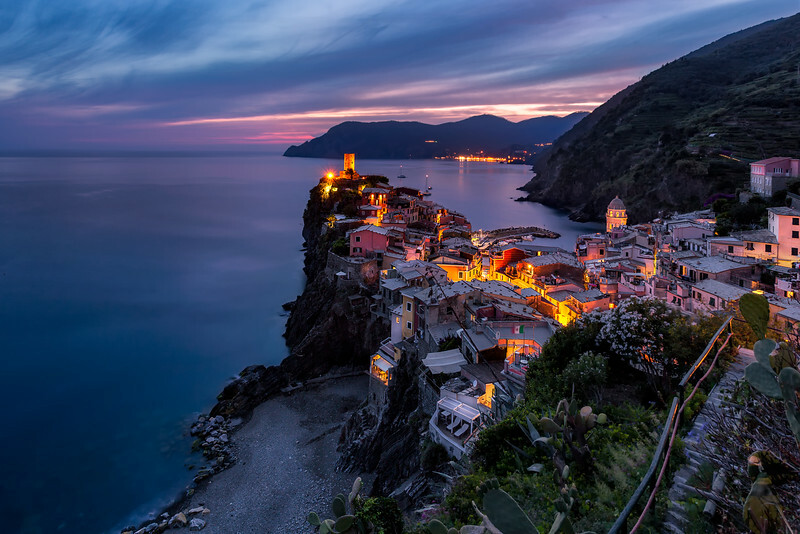 While the beauty of the Blue Hour is clearly evident in the Manarola image above, it wasn't until I stood at a viewpoint overlooking Vernazza (with Monterosso Al Mare in the distance) that I understood what the fully realized potential of the Blue Hour in all of its majesty looked like. The key to good Blue Hour pictures is finding the right exposure balance. It's vital not to blow out the highlights in the artificial city lights. I find that taking multiple exposures and manually blending them together in Photoshop helps me to achieve an artistic and beautiful vision of the scene. It allows the photographer to capture a much larger dynamic range than the camera can accommodate in a single exposure and is also a great way to combine some of the fleeting colors at the tail end of sunset with the blue hour. I highly recommend viewing travel photographer Elia Locardi's portfolio and tutorials to master this style. As a side note, using small apertures will ensure sharpness throughout the image and have the added side effect of creating tiny starbursts in the lights. Photography is all about finding unique and fresh perspectives on the world around us. 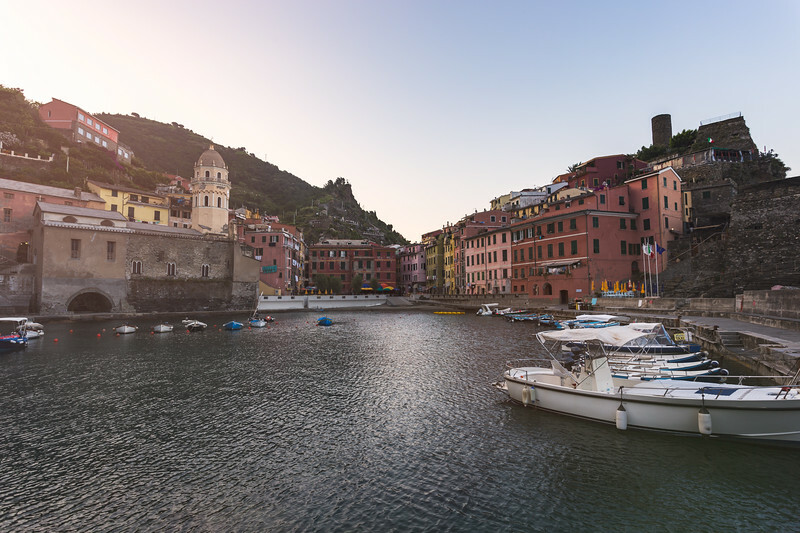 With millions of tourists visiting the Cinque Terre annually, it seems impossible to find a new way to capture the towns. However, the proliferation of drone technology has led to some truly remarkable views in recent years. Armed with my DJI Phantom 4, I endeavored to showcase the five towns in unexpected ways. 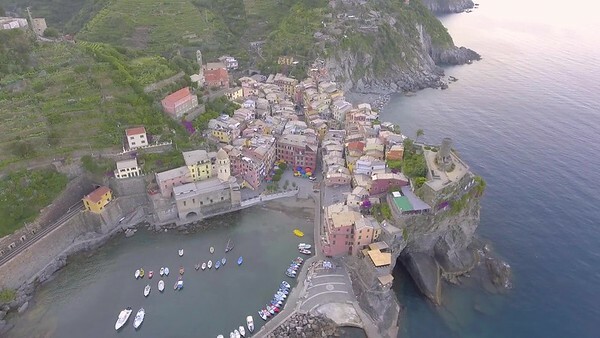 After all the images I'd seen of the Cinque Terre, I couldn't wait to see them from above. Adding to my list of reasons why photographers should get up at sunrise is that flying a drone first thing in the morning is much easier and more relaxing than when surrounded by other people in the middle of the day or at sunset. 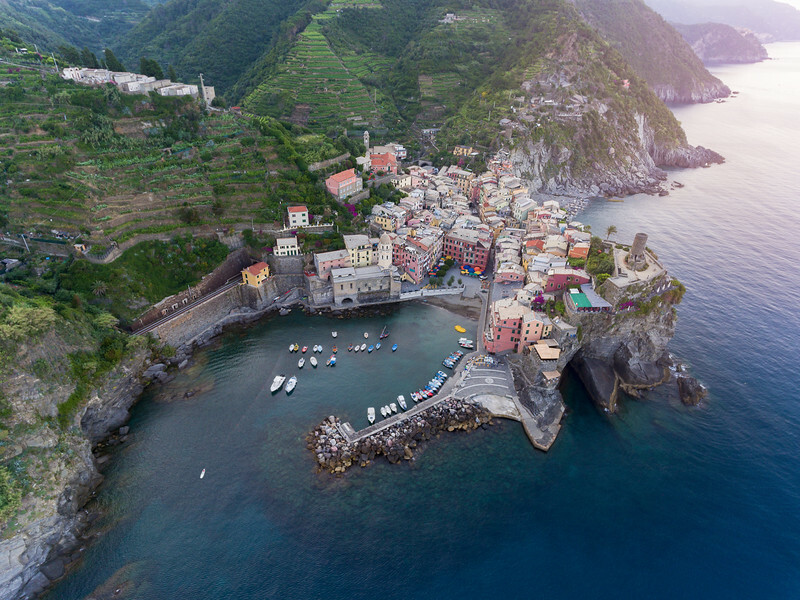 With only a couple of local fishermen preparing their boats for the day to keep me company, I spent a delightful morning flying over Vernazza and rediscovering the town and coastline with new eyes. It's ironic that flying hundreds of feet up helped me better appreciate the small details — the rainbow tapestry of cafe umbrellas neatly arranged in the town’s main square, the row of boats docked in a line in the picturesque harbor, the jumble of rocks where sunbathers would lay out in en masse a few hours later. As I took my final drone flight of the morning, the sun crested the mountains behind the town and flooded the hills with golden rays. I flew further and further out to sea, watching on my screen as the old sentinel watchtower grew smaller in the distance and the distinction between the village and the lush landscape blurred. It was a fitting conclusion to my time spent capturing the beauty of the Cinque Terre.